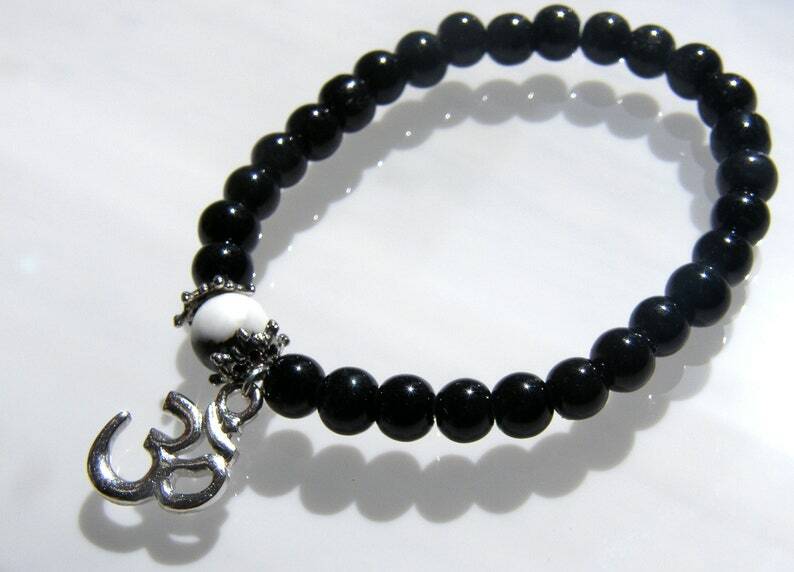 This black onyx glass bead stretch bracelet has a white Howlite bead focal point with a silver filled OM charm that dangles. Silver filled bead caps adorn Howlite bead. This meditation bracelet is for the average female stretch bracelet wrist but please convo for larger or smaller sizes... I will be happy to adjust. Om is the syllable of Om or AUM which is said to be the primordial vibration of the universe. In the tradition of yoga, Om has been used as a powerful mantra for thousands of years. It's sound has the power to carry the listener's awareness into a deep state of meditative absorption.